Alumina ceramic fasteners are one of the most thermally resistant fasteners available. Due to their outstanding thermal resiustance, alumina ceramic fasteners are geared for the most demanding high temperature applications. Alumina ceramic fasteners also have outstanding corrosion resistance and are highly chemically resistant to acids, solvents, and salts. Additionally, alumina ceramic fasteners find many uses in high voltage applications due to their non-conductive electrical properties. Alumina ceramic fasteners are available in both metric and standard sizes. Please contact us if you have any questions about the properties or availability of our ceramic fasteners. Fasteners made from customer specified ceramic grades or custom dimensions are available upon request. Alumina ceramic or Aluminum oxide (Al203) is the most common grade of alumina ceramics and is designated as being 99.8% pure. Alumina is most known for high temperature stability and has a usable temperature limit of 3000°F (1650°C). Alumin has the greatest balance of economy, mechanical and thermal properties. 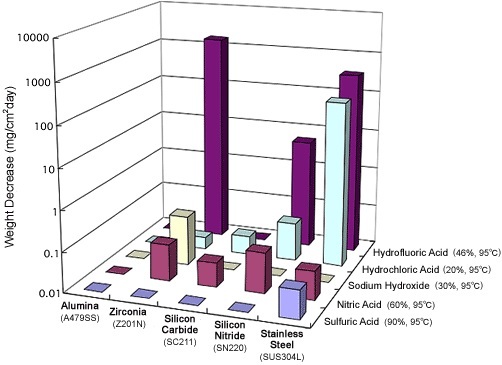 Various other compositions of alumina ceramic are available upon request.